Every year, scores of people get into trouble on Table Mountain. It is critical that you prepare yourself correctly and that you respect the mountain. Pretty much every time I go up the mountain I see people who are ill-equipped: inappropriate footwear, no water, no warm clothing, and often no real clue about the route they are on. 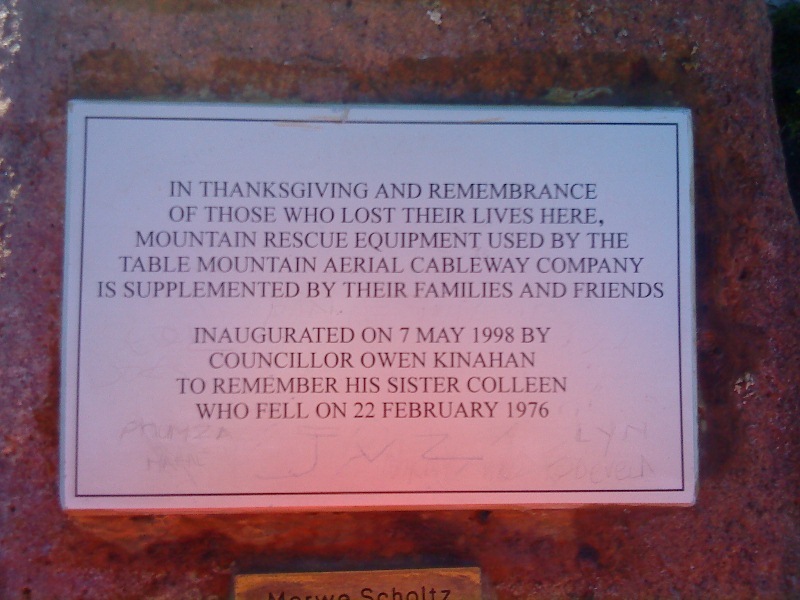 The memorial near the restaurant on the top of Table Mountain should serve as a sober reminder to all of us of just how much danger awaits on the mountain. If that is not warning enough, watch or read 27 Hours Between a Rock and a Hard Place to get an idea of how quickly things can go drastically wrong! The Cape is notorious for changeable, wet and windy weather. Nowhere is this more noticeable than up on Table Mountain. You should be prepared for cold at all times, and should be vigilant in your watch on changing weather conditions. Not only are you at danger from cold temperatures, but it always amazes and sobers me to realise how quickly you become disorientated when visibility is reduced to a matter of metres by mist or cloud. Always take plenty of liquid along with you on your hike. I always walk with a minimum of 1.5 litres — even on short hikes. There are plenty of streams on the mountain depending on the time of year, but you will not always feel inclined to drink from the often brackish water. In hotter weather it is wise to also take a water bottle filled with a commercial isotonic sports drink, like Game or Energade. Take a snack, even on a short walk. An energy boosting snack whilst enjoying the view from the top will allow you to enjoy your walk to the end. Dried and fresh fruit, peanuts & raisins, biscuits and chocolate all make it into my bag at times! In winter I have taken to carrying a flask of tea, coffee or hot chocolate which is a real warming treat on a cold wet hike! Proper hydration and nutrition will save your life in an emergency situation, helping ensure a clear mind for rational decision-making. Always, always carry warm clothing. I always have a thick, warm high-collared fleece top in my back-pack as well as a CAPESTORM Helium Jacket. If there is any doubt, I carry wet-weather gear (a jacket or a light shell), thermal gloves and a beanie. I usually hike in shorts, even when it is going to be fairly cool — unless it is wet or I know I will be walking on a narrow track through scratchy fynbos. It is worth having a fully charged cellphone with you (it is worth switching it off to conserve battery power). Cellphone reception may be patchy, but you may still be able to get at least an SMS out. Much of Table Mountain is covered. Pack some kind of lighting into your daypack, preferable a headlamp. You will need it if you are delayed and darkness falls to light your way, or to signal your position to rescuers. In addition, glow-sticks are also effective (they are waterproof and and the batteries can’t run flat). All of my packs have a whistle attached. You will have more success attracting attention using a whistle than by shouting. Know your route, or hike with someone who does. Let someone know where you are going, and how long you plan to be — and then stick to your route! If at any stage you feel uncertain, trust your instincts and turn back. Carrying a map is not a bad idea, I recommend the Slingsby Maps range. Always remember that it is often far more difficult to come down than it is to go up — ask Tigger! Some routes should not be attempted by the inexperienced! 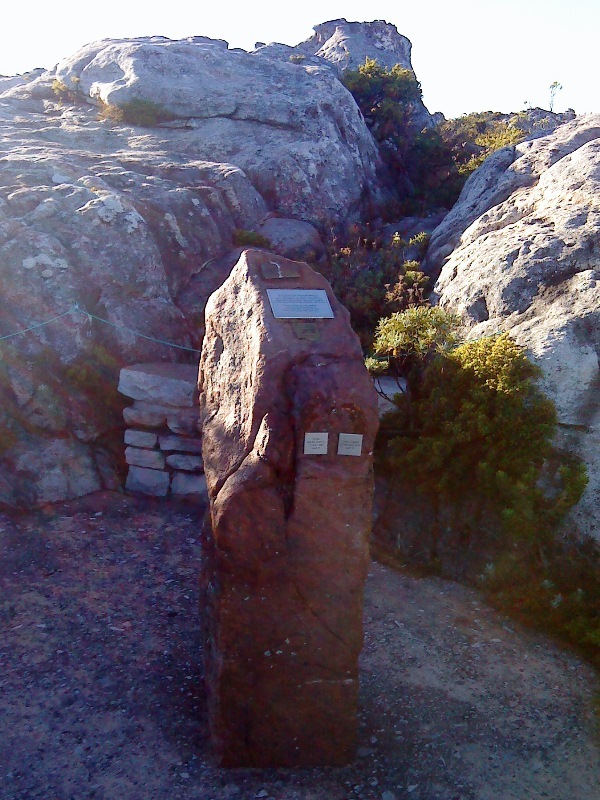 A simple Google search for the India—Venster Route on Table Mountain will illustrate this: people regularly have serious accidents or fall to their deaths on the mountain. The Right Face—Arrow Face Traverse is dangerous, and the Ledges area is extremely dangerous. I have personally had a truly scary experience on the Hiddingh—Ascension Route. 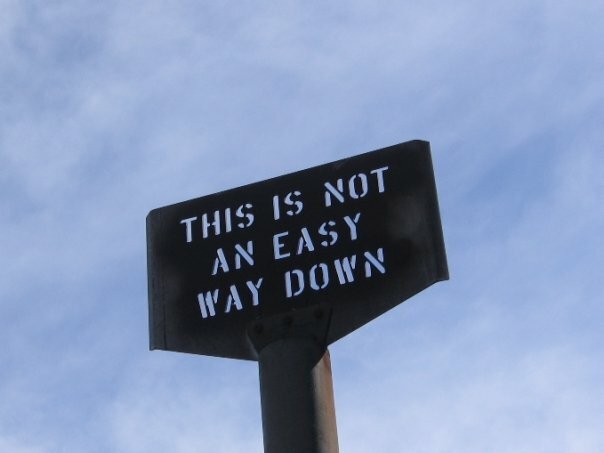 Please do not under any circumstances base your route decisions purely on the advice from a book — any book. Get someone experienced to guide you on these routes. This is South Africa. You are safe nowhere. Do not leave anything visible in your car, and make sure it is locked. Do not be seen piling your valuables into the boot / cubby-hole as you prepare to set off. Take as few valuables with you as possible, and be ready to hand them over quickly and without a fuss. I leave my wallet at home, and hike with my credit card and single car key. PLEASE NOTE: The authorities have claimed that the crime on Table Mountain is “under control”, and as a result, have stopped some of the measures that were implemented at the time of all the muggings. This is a shameful fabrication: muggings are still happening regularly — and what’s worse, they are no longer being publicized! Click here for some reports. It still astounds me to see people smoking on the mountain. 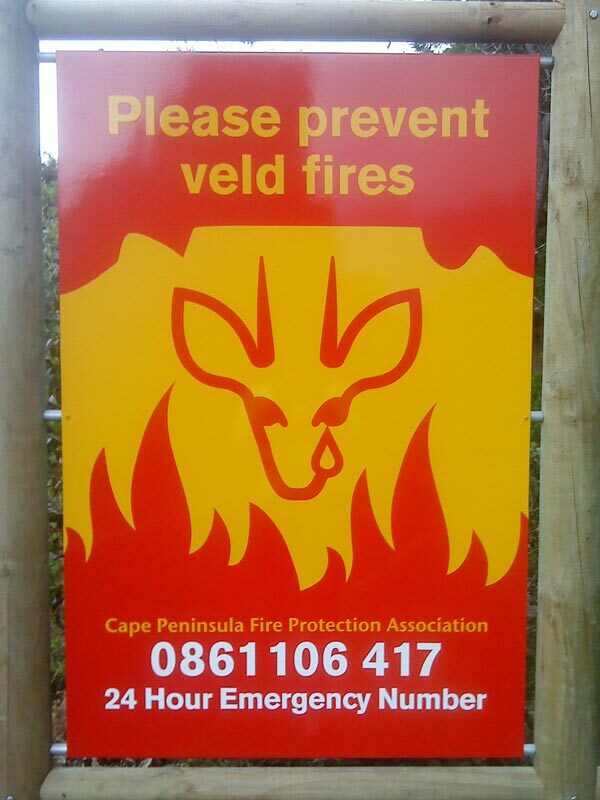 Please be careful not to do anything that might spark off a fire.